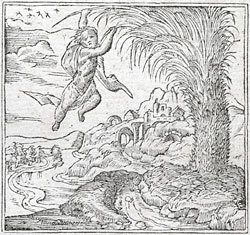 Alciato at Glasgow: Emblem: Obdurandum adversus urgentia. Queis mensas inter primus habetur honos. Qui constantis erit, praemia digna feret. The wood of the palm-tree counteracts a weight and rises up into an arch. The heavier the burden pressing it down, the more it lifts it up. The palm-tree also bears fragrant dates, sweet dainties much valued when served at table. Go, boy, edge your way along the branches and gather them. The man who shows a resolute spirit will receive an appropriate reward. 1. The reaction of palm to a heavy weight is mentioned in various ancient sources, e.g. Pliny, Natural History 16.81.223; Aulus Gellius, Noctes Atticae 3.6. See also Erasmus, Parabolae p.263. It probably refers to a plank of palm-wood, rather than a branch of the living tree. 2. See Erasmus, Parabolae p.241: ‘the palm-tree, having bark with knife-sharp edges, is difficult to climb, but it bears delicious fruit’.